You'll find very little to differentiate most entry-level home theater receivers: passable performance, negligible processing capabilities and limited versatility. 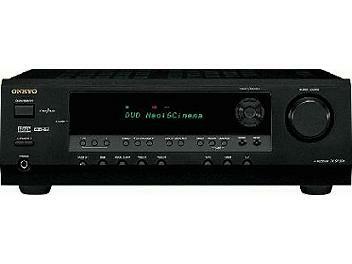 The TX-SR304E 5.1-channel A/V surround home theater receiver doesn't follow that well-trodden path. By giving you the connections to today's most popular A/V components-HDTVs, digital video recorders, gaming consoles, etc-the TX-SR304E broadens your entertainment possibilities beyond basic DVD and CD playback. Naturally, you'll want the audio quality associated with the Onkyo name. That's why we've included the circuitry and quality parts found in other Onkyo home theater receivers: Optimum Gain Volume Circuitry, 192 kHz/24-bit DACs, a 32-bit DSP chip, and an H.C.P.S. (High Current Power Supply) transformer. Keeping in mind what's really important, the TX-SR304E provides a user-friendly, accessible solution for your home entertainment.